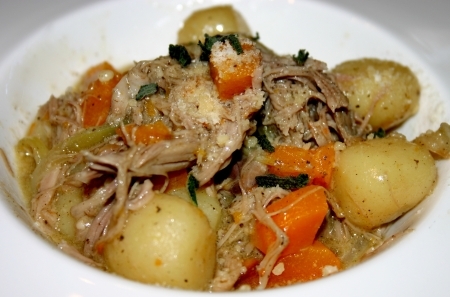 What could be tastier or easier than slow cooking a duck in your crock pot? Take it a step further and you have a wonderful dish that is full of fall flavor with an Italian flair. Duck has a more robust flavor than chicken that pairs well with the robust comfort style food that fall has to offer. Serve this dish at your next dinner party or as a unique take on a Thanksgiving dinner that will have everyone chatting for hours! Try to find the same brand of the pillowy gnocchi being used or something similar. Keep in mind that the duck will take time to thaw. Ingredient amounts will serve between 6 – 8 people. 4 cups of diced butternut squash, an average size squash about 1 lb. Thaw duck and remove anything inside it and the neck. Rinse and place duck into a large slow cooker breast side down. Add 1/2 tablespoon of kosher salt, water and poultry seasoning. Cover and cook for 4 hours on high until meat easily falls off the bone. Remove duck and place into a large dish too cool. Do not discard juices in slow cooker, because it is going to be your broth to finish the entrée. Once cool enough to handle, remove all the meat, shred and return all meat back into the slow cooker. Make sure no bones or fat remain in slow cooker, and that you have removed the bones and fat from the duck. Lower slow cooker to low heat, cover and cook one more hour. Using a large slotted spoon remove all duck meat from broth and place into strainer that is over a large bowl to capture the juices (broth). Set aside. While duck is cooking prepare the other components of this dish. Remove the rind and seeds from the squash and dice into small pieces. Place onto a cookie sheet sprayed with non-stick cooking spray. Spray squash with non-stick cooking spray until evenly coated and sprinkle with a little bit of kosher salt. Place into a preheated oven at 375 degrees for 20 minutes or until fork tender. Remove and set aside. Cook gnocchi per package directions and set aside. Complete the meal by heating the olive oil over medium high heat. Add sliced onions and sauté until they begin to brown. Add 2 cups of the duck broth to deglaze the skillet. Add parmesan cheese, butternut squash, duck, additional salt and gnocchi to skillet. Gently stir until evenly combined. Simmer for a few minutes to make sure that everything has been warmed. Check flavor at this point to see if any additional kosher salt is needed. Ladle into decorative bowls and garnish with freshly grated parmesan cheese and a chiffonade of sage leaves. Try a sweeter style of wine like a Viognier or a Riesling – Yalumba Viognier (South Australia), McManis Family Vineyards Viognier (California), Dr. Pauly Bergweiler Bernkasteler alte Badstube am Doctorberg Riesling Spätlese (Germany), Selbach-Oster Zeltinger Himmelreich Riesling Kabinett Halbtrocken (Germany) or a beer – Ayinger Oktober Fest-Märzen – Germany, Dogfish Head Punkin Ale (Milton, DE) or Michelob Brewing Co. Jack’s Pumpkin Spice Ale (St. Louis, MO).